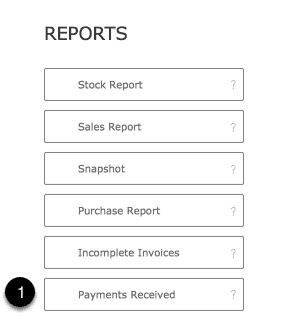 Use this report to report on payments received from clients from artwork sales for a specified date range. Use the filter to specify a date range or enter the same date in both fields to specify a single date and, where required, specify to filter who made the payment. Export details of filtered result in a format suitable for use in a spreadsheet. Edit the method of payment. Review details of the original sale with the option to move directly to the original invoice.